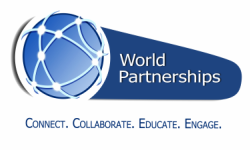 World Partnerships generates innovative partnerships, collaboration and actions among a unique network of global leaders. with Secretary of State Hillary Clinton. Long-term working relationships across international borders do not spontaneously arise from a single encounter. Relationship-building requires a systematic approach to “connecting the dots”. Our IVLP alumni are a unique global “New Generation” network of pioneering women leaders, journalists, community organizers, policy officials, business and political leaders, environmental activists and young entrepreneurs (and many more) engaged in changing their world. The New Generation are all looking for a new way to connect, collaborate, educate and engage across international borders with each other, and with the Americans they have encountered. World Partnerships builds lasting, innovative relationships with this unique, "New Generation" network of global leaders through ongoing project collaboration with its alumni, through social networks, and through its alumni advisory services. "Building bridges in construction engineering is regarded as the highest achievement, but building bridges among people is a masterpiece. Sometimes it takes a lifetime, but I think that small steps are all it takes."